A man has joy by the answer of his mouth and a word spoken in due season, how good it is. 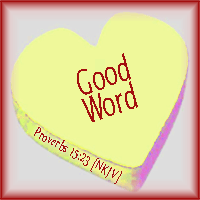 One definition of “Good Word” would be words that have admirable, pleasing, superior,or positive qualities. A “Good Word” is not negative, bad or mediocre. A good word gives joy to the speaker as well as the receiver. Dear Lord, today I pray that I might speak only good words. In every situation, may the answer of my mouth be positive, pleasing and joyful. I don’t want to speak words that are mediocre, Lord, I want my words to have purpose, to be excellent and uplifting. So, today, I pray that You, Lord, will give me the wisdom and discernment I need to speak a good word to everyone I meet and so bring gladness and joy to their heart and mine for Your glory.